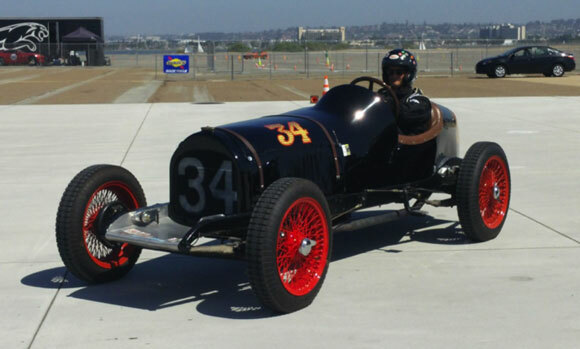 This was SVRA’s first year with this event. It was co-promoted by the San Diego Fleet Week Foundation, and it is a complete blast for all involved. The race is run on the runways and taxiways of the Navy’s North Island airfield. Temporary course markers consisting of cones, hay bales and barrels give the event a distinct old-school appeal. The race is a main attraction, to be sure, but it shares that honor with the base itself. This front line defense facility is completely opened to the public during Fleet Week, which seems odd given current levels of terrorist activity. It was an honor to be welcomed aboard. 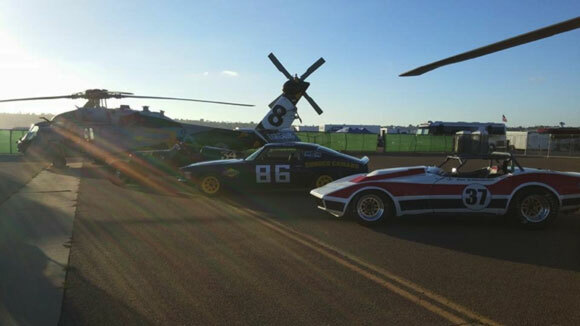 The racecars and the military aircraft were in close company! 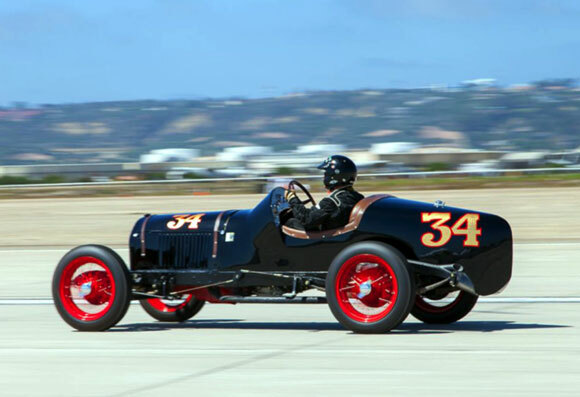 In addition to our races, there was a mammoth car show, a pit stop competition among the various Navy squadron teams, and vendors for everything from ice cream to insurance. 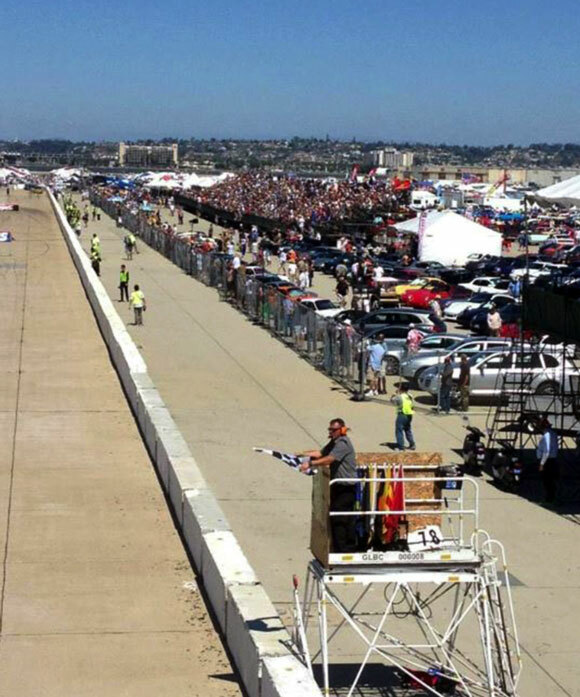 The race drew a record 300 entries and the crowd for the three day event was estimated at 100,000. This is just one grandstand. Thousands of people are behind it. 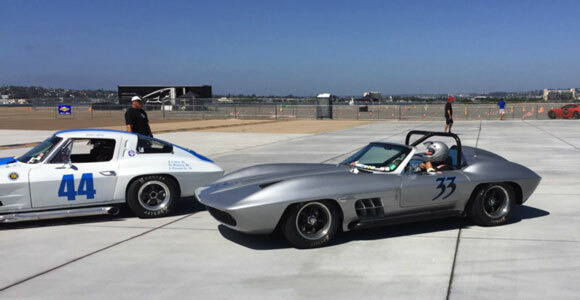 Duntov brought Clair’s 1968 Corvette, Tony’s 1934 Chevy engined Indy Car and his Historic Trans-Am Camaro. Tony chose not to run the Camaro and only ran the Indy Car on Saturday. 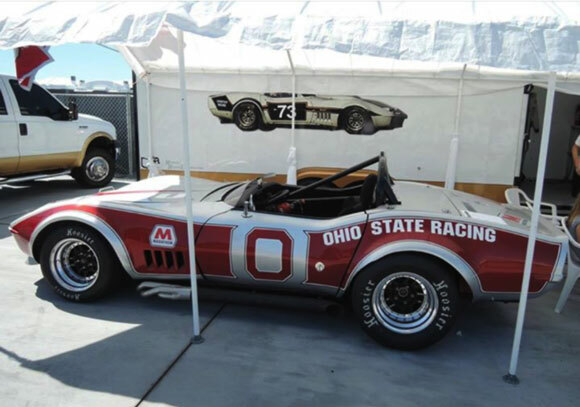 Colby Hillman brought his 1968 Ohio State Corvette that had just undergone a major restoration at Duntov’s shop. The racing itself was a bit different. 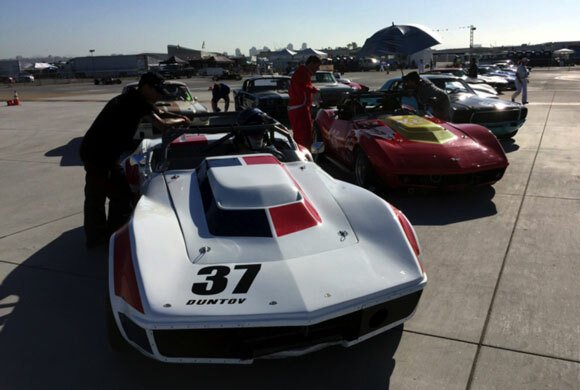 The grid included several unusual cars not normally seen at SVRA events in the East. There was a real shortage of big block Corvettes; Clair had the only one! As mentioned above, there were some unusual Group 6 cars at Coronado! In the qualifying race, Colby finished seventh in a field of 33 cars in his Gold Medallion Ohio State Corvette. It was a great first outing for a car that last raced in the seventies. Colby had business to attend to and left the track before the Sunday feature race. Clair qualified on the pole and won the feature race with a 10 second margin of victory. Behind him was a spirited race between four cars passing and re-passing each other, much to the delight of the crowd. On some circuits a big block engine is not an advantage. Coronado is not one of those circuits.